Just wanted to drop you a line to let you know that I’ve recently discovered your SolderSmoke podcasts and am enjoying the heck out of them! In fact, you and Pete have inspired me to break away from the thermatrons and delve into the wonderful world of the TIA transceiver, and after several weeks of sniffing rosin, my new rig is now receiving signals without the aid of any external life support! It’s still a bit haywired, but I’m looking forward to pairing it with my little 6AG76L6 transmitter for a few SKN QSOs tomorrow. Anyway, thanks for putting forth the time and effort to do the podcast! All the best to you, Pete and your families in the new year. Alan Wolke W2AEW Interviewed on QSO Today! And it is GREAT! A very cool interview indeed. But how could it be otherwise? With Eric on one end of the Skype connection and Alan on the other, coolness was inevitable. In this interview we are reminded of the FACT that Alan has a major case of THE KNACK. 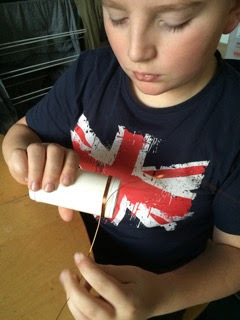 Proof is found in the way he obtained the wire for his first SW antenna: he unwound the magnet wire in the yoke transformer of a discarded TV set. THAT, my friends, is the stuff that KNACK is made of! I share Alan's affection for the TEC 465 'scope, but I twitched a bit when he said it is "easy to work on." It scared the hell out of me! 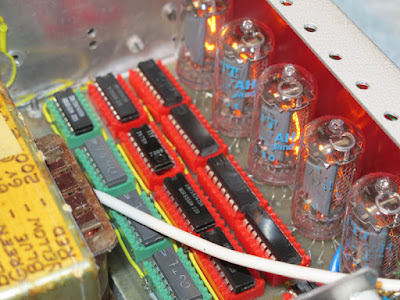 It features both plug-in transistors and lethally high voltage -- so high that Alan had to lend me a special high voltage probe just to do the measurements. 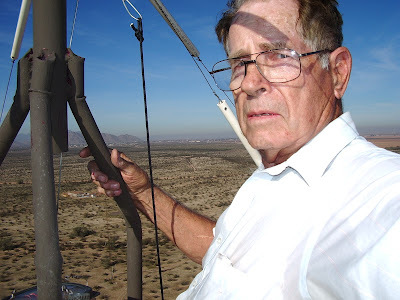 Alan's mention of Project Diana and the history of moonbounce reminded me of Ross Bateman, W4AO, the wizard who, in 1952 bounced the first amateur radio signals off the moon. He did it from the town I live in now, Falls Church, Virginia. Alan provided me with the address from which the signals were launched. Hooray! After 42 years on the ham bands I have finally made a contact on 160 meters. And it was on AM, using John Zaruba's DX-100. My antenna is the 185 foot wire that I mentioned in yesterday's post. I built an L network using a roller inductor and a bread-slicer cap -- the network is at the base of the antenna. Before dawn this morning I threw my call into a round-table on 1885 kc. Pete WA1SOV up in Connecticut heard me and we had a short contact. Hooray! I hope this puts some pressure on Steve Silverman and Pete Juliano -- they have sworn A SOLEMN OATH to get on top band. I'm especially worried about Pete's adherence to this pledge -- he seems to be going a bit wobbly on us, playing with Raspberry Pi's and things like that. C'mon guys! Top Band awaits! My antenna needs improvement. More radials might help. "Receiver Here is My SWR meter OM..."
Santa managed to include in his delivery some of the materials that I needed to build my 160 meter inverted L antenna. 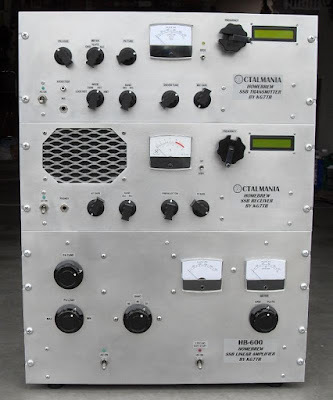 You see, Steve Silverman, Pete Juliano and I have collectively more than 150 years in ham radio, but none of us have ever operated on Top Band. The three of us have taken A SOLEMN OATH to correct this horrendous deficiency. I am in the vanguard, partly due to a weather pattern that is perfect for antenna building. Armed with a new elastic band for my Wrist-Rocket sling shot and some perfectly shaped lead sinkers, yesterday -- with the obvious cooperation of The Radio Gods -- I managed to get two ropes over some 70 foot trees. Soon -- with minimal gnashing of teeth -- I had 185 feet of wire in the air. This morning I was messing around with L networks at the base of the antenna. I took a coffee break, leaving the 185 foot wire and the ground system connected to the coax. I had the transmitter off, so I was surprised to see the SWR meter jumping around a bit, up significantly from zero. What could that be? It wasn't coming from my station, so it had to be coming from some other transmitter. And the slight bit of jumping that I saw on the SWR meter had the familiar pattern of the human voice. Some radio sleuthing ensued. I flipped the station antenna switch to the "bench" position, and connected my scope to the coax. Wow! I immediately saw a big strong AM signal with modulation, at about 5 or 6 volts peak to peak. 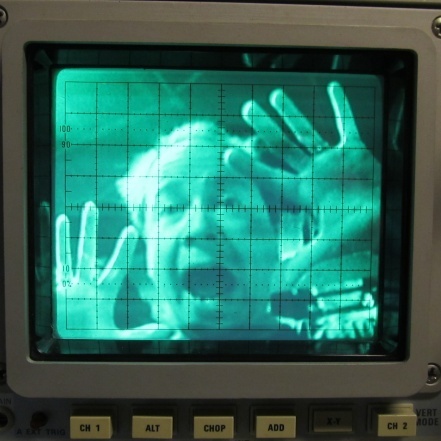 The Rigol 'scope gave the frequency: 1220 kHz. I tuned the HQ-100 to that frequency. As I listened to Gospel broadcast, I could follow the voice peaks on the 'scope. Some Googling ID's the station: WFAX 1220 AM. 5 kilowatts in the daytime. 1.5 miles from my house. The vertical portion of the inverted L is obviously picking up a LOT of energy from the WFAX tower. And the horizontal portion of my antenna is broadside to the WFAX tower. 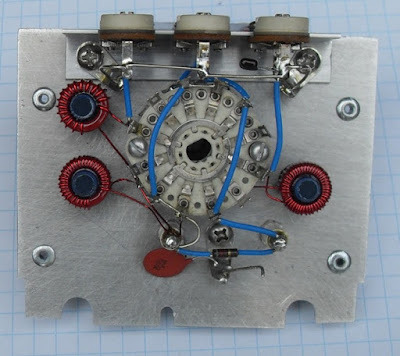 Of course this all made me think about throwing together a crystal radio, but then I realized I'd already listened to WFAX with simple diode -- the one in my SWR meter. That little SWR meter was acting like a crystal radio with a visual output! But in any case, Merry Christmas to all! Thanks to Rick N3FJZ for sending this to us. In 25 minutes these fellows manage to capture and explain much of the "magic" of radio. 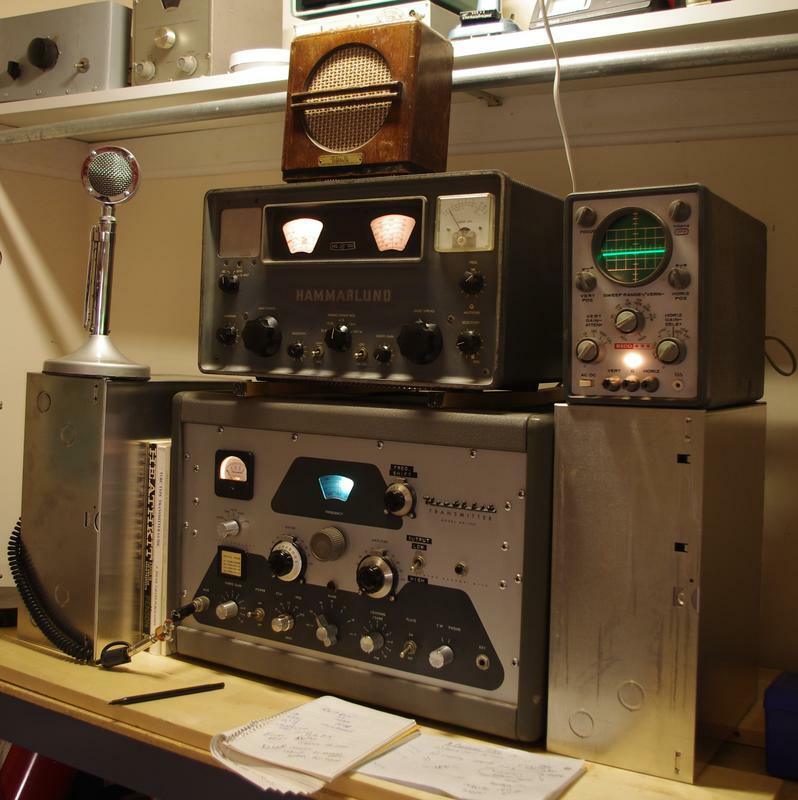 Great shots of Marconi, and of Hertz's first rig. Amazing how they built their own spark transmitter and coherer receiver, launched a kite antenna and sent a signal across the harbor. Great stuff. Lots of history. We've met Mr. Wells before -- he was "jailed for having the Knack!" 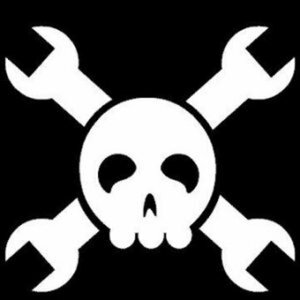 SolderSmoke Podcast #183 is available. And it is GOOD! -- Frankenstein Receiver: IT IS ALIVE! AND BINAURAL!!! -- 160 Meter AM OR BUST! -- Fun on 40 AM -- Lots of Multi Elmac AF-67s! Who knew! -- The Amateur's Code, and violations thereof. -- Negative Frequencies? I don't think so. -- G8GNR puts Mighty Mite on AM! You can just feel the homebrew enthusiasm in this video. You can almost smell the solder smoke. We love it when people do videos showing their new rigs spread out on the workbench with individual boards held together by bits of solder. It is even better when, as in this video, the boards are atop hand-drawn schematic and parts-placement diagrams with much NOODLING in evidence. FB Mikele! And I agree with you about the stations who call "CQ DX-only." I used to hear that a lot when I was in Europe, and I hear it hear quite a bit too. I always think it is a contradiction in terms. There were times when I was sitting there with a new rig, anxious to get a signal report from a strong station, and he wouldn't come back to me because of the Continent that I was sitting in! Pity. His loss. He might have been interested to hear about the contraption I was testing. It could have been fun, but no, he preferred to work VK3 or Puerto Rico for the 1000th time. Indeed, three cheers for the legendary Pete Juliano! This suggestion from across the pond is a bit "out there." In fact, for me it brought to mind the famous line from the Noel Coward song about who goes out in the mid-day sun... This does seem like an endeavor for our stoic British cousins. 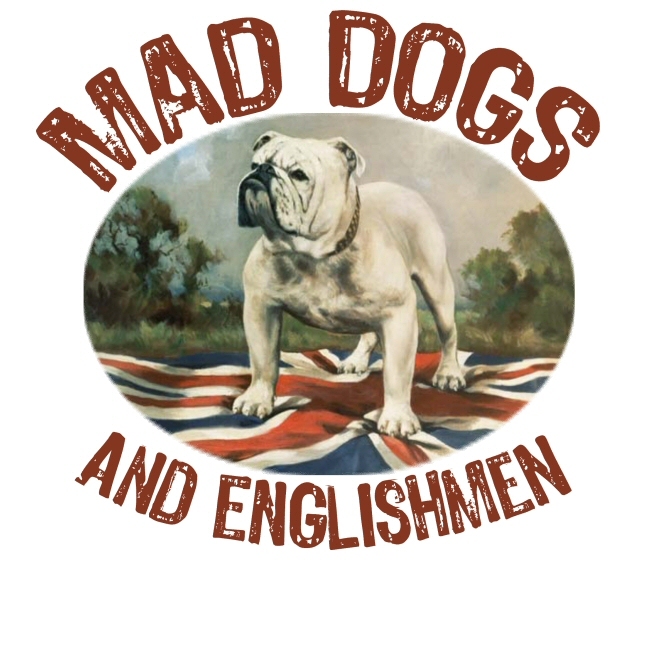 You'll need a very stiff upper lip to AM modulate a Michigan Mighty Mite! Peter's observation about the "SSB kilowatt nerds" resonated with me and reminded me of the reaction I got when I tried to put a DSB rig on the air in London. But hey, go for it Peter! Please let us know the results. For those who are rock-bound in the CW portion of the band (like 3579) this might be something fun to try using a dummy load -- just to see if you can send an AM Mighty Mite signal across the shack. Your recent Soldersmoke thoughts re. MMMites have been niggling my imagination; I think radio should be fun, educational, simple and cheap, to encourage young folks to get a license and "appliance users" to melt some solder. 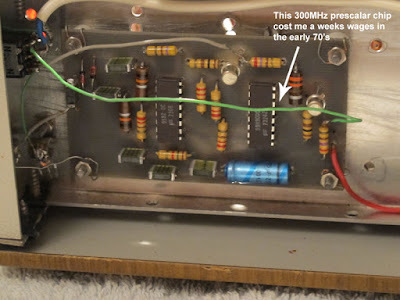 Mike Rainey (AA1TJ) and Jim Kearman (KR1S) have done superb work in reducing RF circuits to a functional minimum... so egged on by a certain Mr. Bill Meara, I'm looking at modulating a MMMite Tx on 80m and building the simple Rx to go with it. 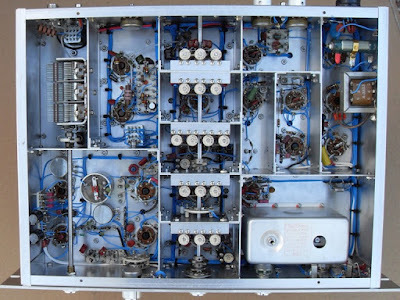 I chose 3615kHz as it's a frequency UK VMARS (Vintage Military Amat Rad Soc) use for A.M. - the SSB kilowatt nerds who think the sky will fall down if A.M. corrupts the ionosphere have accepted a few enthusiasts firing a watt or ten of A.M. skywards. I blame you want to say thanks for setting my mind in this direction. Yep, that's it: job done, the MMM now produces A.M. as the base current, fed by 10k from the +ve rail in the original MMM, is now partially shunted to ground by the electret capsule. I'll adjust the base bias resistor to get 50% "no speech" carrier and good mod. depth. I'm trying to avoid a mic amp stage; keeps it simple & sweet. If I can get 500mW in total, that's ~ 100mW in each sideband - on a good day with a following wind, on 80m that should go a mile or twenty. 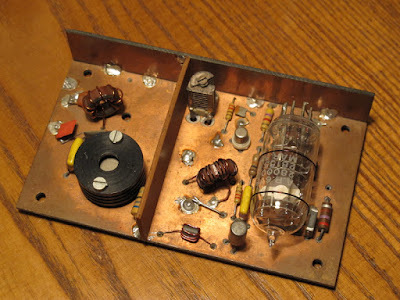 Which leaves a drop dead simple Rx to design - somebody has done similar, HERE, You got it: an LM386 audio amp as a regen Rx. I had considered the ZN414 TRF Rx, or it's modern equivalents, but they are nowhere near as common as an LM386, or as cheap. IF it works on 80m...! Or, I could try an xtal controlled regen Rx, as per Mike / Jim's designs. Either which way, I'm sure I can find a cheap, simple and effective Rx - but if you know of any.....? I got a card from Rick N3FJZ today. FB! Note the lines for "VFO": Si5351! And "Finals": Dual IRF-510s! 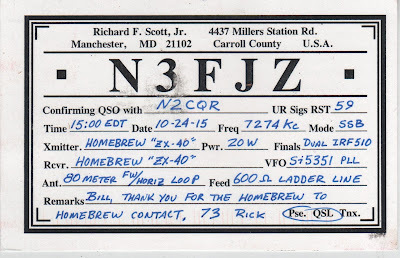 Rick wrote that his card is also homebrew! Thanks Rick. Thanks for the GREAT info. Can't wait to try things out. One day soon (Christmas is coming) I will have a new computer and can start learning LTSpice. Great tribal knowledge on the over all gain adjustments as well. And I won't tell the illuminati . As for your articles, blogs, tribal knowledge and pot casts with Bill. Love them. Listen and read everyone. Print and file for later. Mostly because I can't keep up with you on all the great projects. But in the sprit of home brew and not just stuffing boards or following explicit directions I have built the LBS with my own mods. 1. It's dual band. Almost. 40&20 LPF and BPF already in. 5watt tx works great but plan on putting in about 40 watts them getting around to making the dual band changes to the sketch and finishing things. 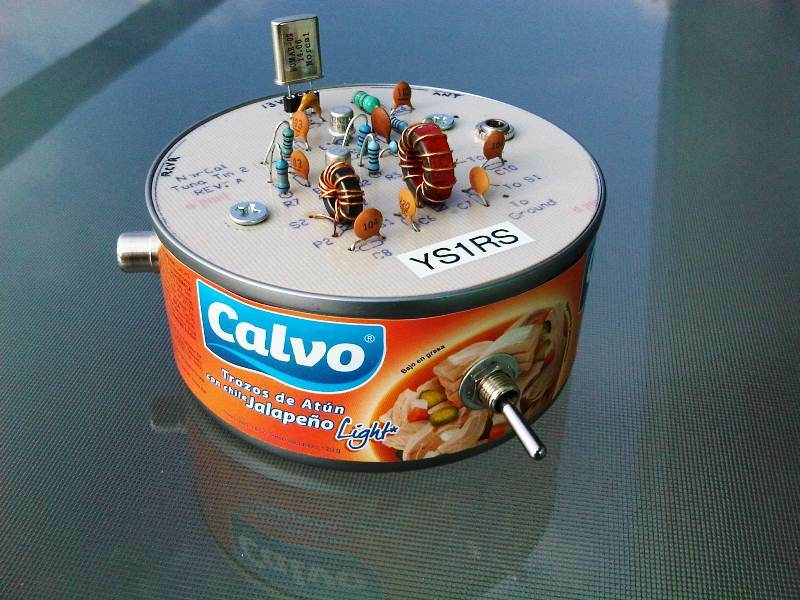 I used my own audio amp design. Well not all mine. Manufacture spec sheet and Internet info and LBS. Your preamp, a NTE1288 10 watt audio IC. Attached are pix of the LBS so far. The current rig will be 20 meters only for digital modes. It will have a built in audio interface and thinking about including raspberry pi and TFT screen. But that's got to be down the road. It's a hybrid again. Parts of LBS and ZIA and parts of Simpleceiver. I already had the ZIA IFs built so will have to try the dual FET on the next rig. Modified the audio again. 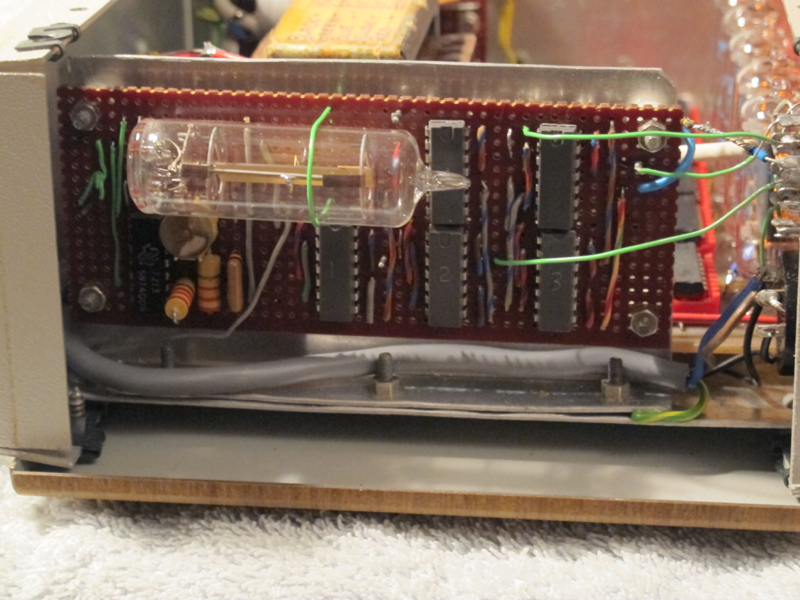 Put in an FET AGC between the preamp and the final IC. About 40 dB dynamic range so should cut down on the vol control twisting when listening to a QSO with one strong and one weak station. So far this build consists of a box of tested modules that have not been hooked together yet. Your FET RF amp will the next board. Also working on an Arduino Lightning detector with 5115 display. Almost got that one.... Have built couple prices of test equipment. A xtal osc with onboard freq counter and an LCR Transistor tester. Oh and lets not forget the MMM on 3.58! I personally know one other ham building a LBS. So don't think your talking into outer space. We are out here listening! And learning! And having a great time. And yes, when I catch up on projects, I'm going to build the actual Simpleceiver. Thanks again for the fast response. I'll let you know how it turns out. 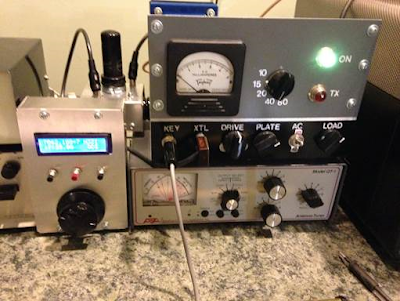 Rick N3FJZ and his Lakeside direct conversion receiver bolstered my spirits when I was getting some harshly critical reviews of my signal on 40 meters a while back. Rick happened to pick me up with his homebrew receiver. The Radio Gods seemed to be trying to balance things out. There is a LOT of radio mojo in Rick's Lakeside receiver. Not only does it eschew digital synthesis of the VFO signal, it goes a step further and uses a permeability tuned oscillator -- very cool. The component and material sourcing adds more luster to the rig. 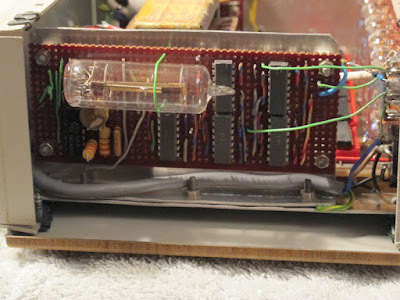 Rick writes: "A lot of the components used to construct the LS-40 were harvested from discarded consumer electronics I collected back in the 1980's. The base substrate material for the Manhattan style construction, as well as the RF tight enclosure for the PTO, is made from a flattened out tin plated food can. All components are discrete; i.e. no IC's or CPU's." Rick has launched a blog. He has some amazing stuff on it. Be sure to check out his ZX-SSB rig. Amazingly detailed documentation Rick! Thanks. Thank you for the podcast and the loads of tribal knowledge from you and Pete! I recently started going through the SolderSmoke backlog, and I am just getting to the Colorburst Liberation Army episodes. I had some crystals for 40m laying around, so I started reading up and winding on a film canister. Later, I thought I'd hop up the current episode of the podcast while I work, and I heard you guys talk about another push for the Michigan Mighty Mite. I happened to be salvaging bits from an recycling-pile VCR at the time, and I came across this crystal with a familiar label: 3.579545. 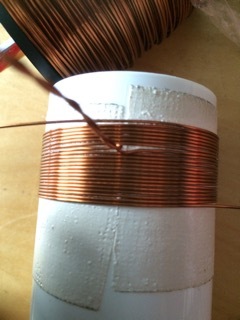 The radio gods have spoken, so I will be winding a new coil for 80m. I thought I'd tell you a quick story anyway, because I just want to be a part of the fun. When I was little, our radios all had retractable antennas, and the TVs all had rabbit ears or loops. I would spend nights trying different materials and orientations to try and get better signal. At one point, I ran as much wire as I could in my brother's room (he had a big garage-sale cabinet tv), and we were getting channels from all over the place. We knew when each channel would be showing reruns of Star Trek, so we could catch an episode or two almost every day of the week. We even got some channels that I thought were only available on satellite. 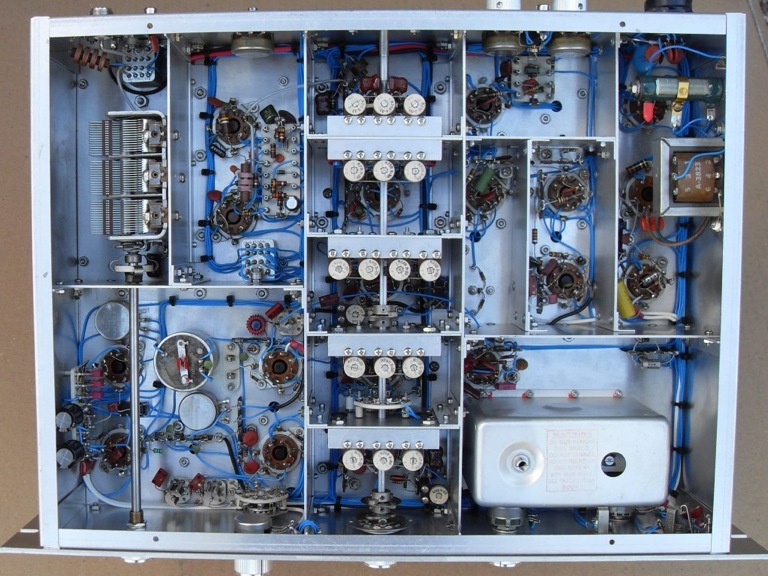 I had read in my box of Popular Mechanics magazines that some dish setups re-broadcast their signal on VHF/UHF frequencies with low power, I always suspected that's what we were picking up. I didn't know much (or really anything) about the theory behind antennas at the time. I'm still a bit hazy, like with the 75 ohm / 50 ohm cable thing. I thought resistance was a function of length, how can different lengths of coax be the same ohm rating? Anyway, I just wanted to let you know I'm new to homebrewing, and you guys are a big part of that! Getting the 3.579545 MHz rock out of a dead VCR definitely adds mojo to the rig. Indeed, TRGHS! Thanks for sharing your Knack Story. I hope to meet up to you, perhaps at the hamfests of Northern Virginia. In my capacity as Grand Poohbah and Arbiter of Capacitor Eligibility, I hereby deem you ELIGIBLE for a variable capacitor. Our secret benefactor will be contacting you. Above you can see Roberto's Salvadoran Tuna Tin. Roberto Describes it: "Homebrew: The Tuna Tin 2 QRPp Transmitter (TT2) with 300 mW output power, 14.060 MHz (20 meters band), Crystal controlled, 13 Volts, CW-Only. As its name implies, its main chassis is a Tuna Tin Can. In our case, it is a delicious and exotic Salvadorian made tuna in chunks, topped with Jalapeño Chile. " Roberto has an amazing collection of gear, much of it thermatron, some of it homebrew. And he has only been on the air five years. He is a true member of the International Brotherhood of Electronic Wizards. His work takes him to some of the most difficult places in the world. FB Roberto! I talked to Roy W7YRV on 40 SSB last night. He was running a homebrew linear. His blog has a lot of information on his truly massive desert antenna system. I was listening to 160 meter AM yesterday afternoon when I heard a familiar call: K2ORS. I knew that someone else had picked up Jean Shepherd's last callsign, so I knew that I was not listening to a CQ from the great beyond. Turns out that K2ORS is now OM Warren Ziegler up in Massachussets. 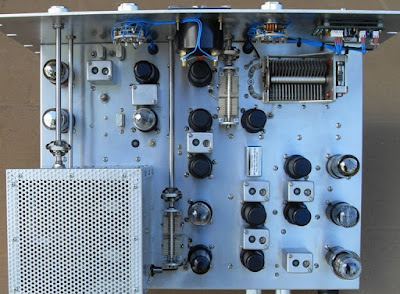 Warren is active on HF and 160 and also works with experimental low frequency transmitters. He is a big fan of Shep. I think Shep would be pleased that someone who melts solder has his old call. Shep said that when, as a teenager, he got his ham radio license, he was so proud that he went around thinking of himseld as "W9QWN, a man of substance." Indeed he was. Thanks to my Michael EI0CL for alerting us to this. It will happen today, very conveniently at lunchtime on the East Coast of North America. I may have to bring my Soviet binoculars to work. It has already been a nice day for astronomy here in the wilds of Northern Virgina. National Public Radio on Sunday alerted me to the fact that Mars is high in the pre-dawn sky. Our friend Armand e-mailed alerting me to possible clear skies this morning. The leaves are down and no longer obstructing my view of the Southern sky. With my six inch telescope I got a very nice view of Jupiter and the four Galilean moons. We are pretty far away from Mars at this point, so I could see no surface feaures, but it is always nice to see that distinctively red disk. And Venus is poised to disappear behind the moon. Good luck with Venus and the Moon. Please send in reports. 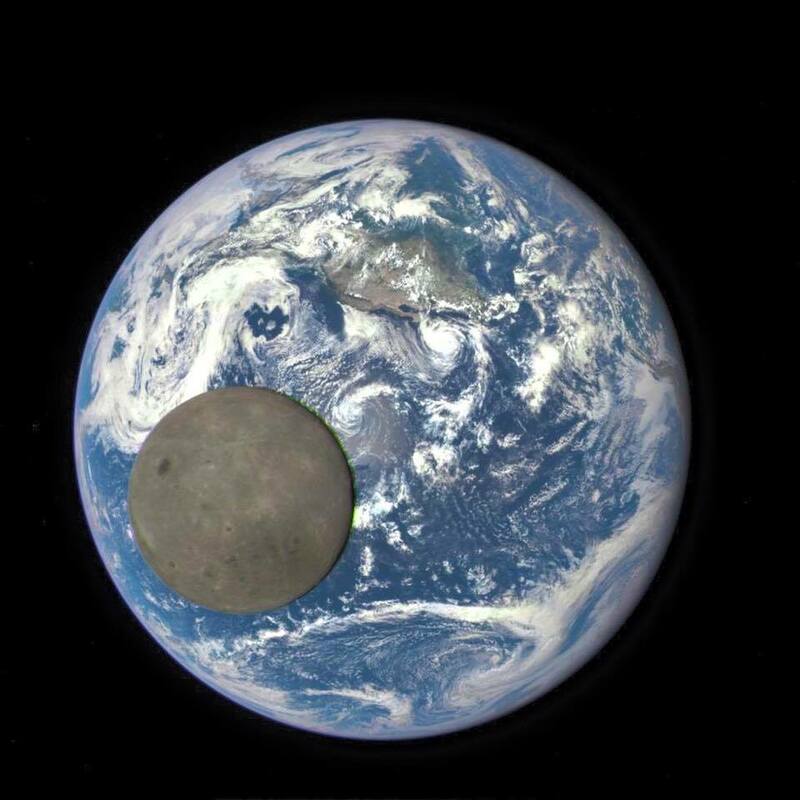 The moon passed between Nasa's Deep Space Climate Observatory and the Earth, allowing the satellite to capture this rare image of the moon's far side in full sunlight. 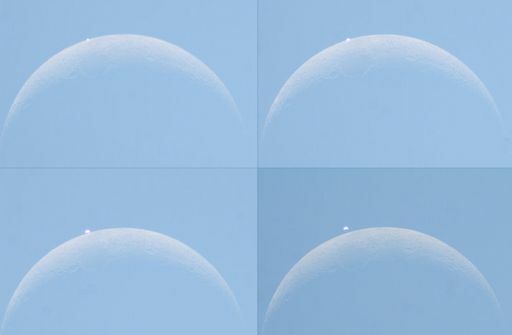 We normally don't see this side of the moon. As the moon is tidally locked to the earth and doesn't rotate, we only ever see the one face from the earth. Awesome shot! Here is my latest project. 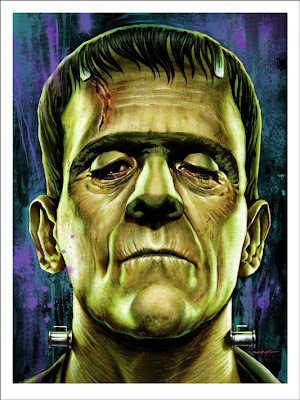 I call it The Frankenstein because of the two BNC connectors that come off the side of the DDS oscillator box -- they look to me like the bolts on Frankenstein's neck. The square waves from the DDS LO also seemed to evoke Frank's bolts. There may be other similarities. We'll see. Here is the idea: Phasing, Direct Conversion, Image Rejecting receiver based largely on the R2 design by Rick Campbell KK7B as presented in the January 1993 QST. I'm using an AD9850 with an M0XPD Kanga board and an Arduino to generate the quadrature LO signals (you can see the square waves on the 'scope in the background). I'm using the software of Richard AD7C; this, combined with the divide-by-4 scheme on the Kanga board, puts the upper limit of reception at 7.3 MHz. That's OK for now. 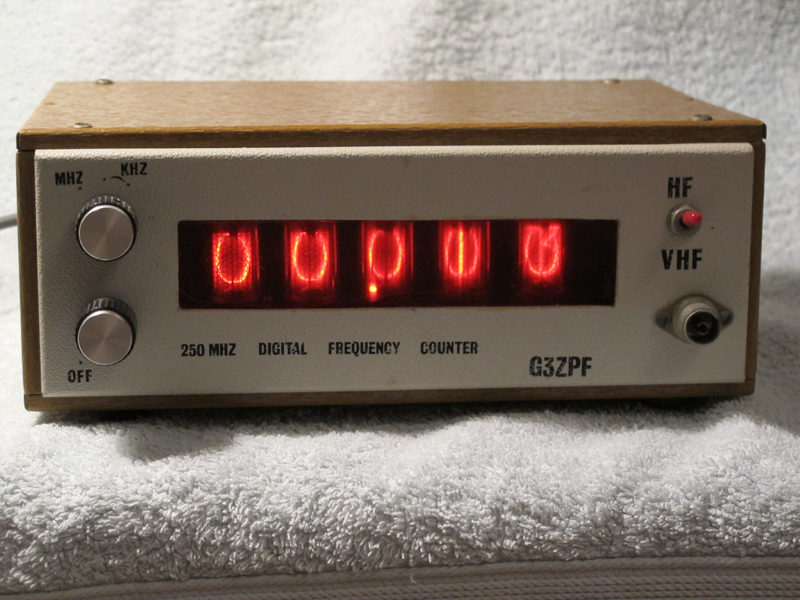 When I first fired up my AD9850 box I was dismayed to find that the square wave quadrature output was no longer there. I was about to give up and get anther shield board, but this kind of surrender bothered me. So I started troubleshooting and isolated the problem to the /4 chips. My soldering of the surface mount chips was, well, a bit dodgy, so I changed to a tiny soldering tip and reheated all those tiny little pads. Hooray! I fixed it. The receiver will be built mostly on a PC board that Pete made for me back when he was trying to convince me to build a fourth BITX receiver. I am pleased to put the board to use. See below. Yesterday I soldered on the two SBL-1 mixers that will form the heart of this receiver. I realized that the very robust quadrature square waves from the Kanga board might be robust enough to fry the sensitive little SBL-1s. Sure enough, I measured about 17 dbm coming out of the Kanga board. 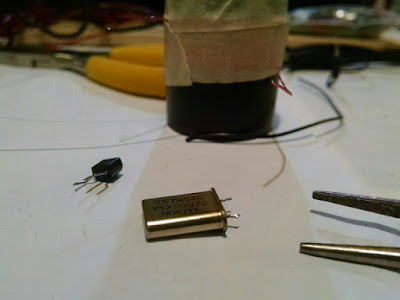 I threw together two roughly 10 db resistive pads. These should prevent the SBL-1s from releasing their smoke. 2) Binaural Receiver! Groovy, stereo CW that floats around in your head, man! 3) I-Q receiver that can be fed into the sound card of the computer for DSP, panoramic display, etc. I promise not use it to find fault with the signals of homebrew SSB rigs. 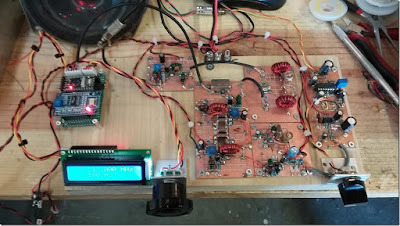 4) SSB image rejecting receiver for easy, Direct Conversion SSB listening without the burden of having to listen to the other side of zero beat. There is already a lot of soul in this new machine: Kanga board with the design my Paul M0XPD, PC board made on Pete's $250,000 CNC machine, and all of it on an actual breadboard (from Italy, I think). Rick Campbell and Peter Parker have commented on the allure of phasing rigs. There is something very attractive about them. There is a cleverness in the way this design exploits the phase relationships between sidebands to allow us to null out the unwanted side of zero beat. It took me a while to really understand how this is done -- once I understood it, I really wanted to build a rig that would make use of this principle. How appropriate! I was casually listening to 40m AM on my refurbished Drake 2B, and I hear the rotation get passed along to none-other than N2CQR - the man that got me excited about the 2B in the first place. 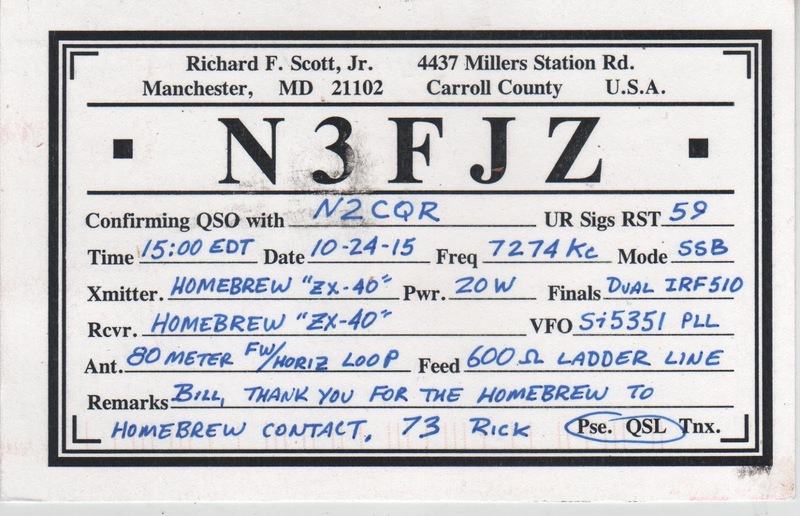 FB 20 over signal in NJ, OM! I was able to grab the video camera quickly before you signed off. Alan's video appears above. Holy cow Alan, THE RADIO GODS HAVE SPOKEN! Clearly you need to get on 40 meter AM. Maybe get a DX-60 or something. In your video I spotted several items in your shack that are also in mine: in addition to the 2B, I see a Turner +2 transistorized microphone, and that little (very useful) RadioShack speaker. Glad you heard me OM -- thanks for the recording! It's always a pleasure to listen to AM QSOs, which hereabouts seem to be mostly on 80 and 60. I bought an FM board for my FT-101ZD with the intention of getting some 10m action, but now I think I'll leave the AM board in (you can't have both) for when I get the beast out of storage. AM, even AM that hasn't been optimised for beautiful audio, sounds so much nicer than SSB. The other side of AM is to get old military rigs up and running, which is quite the opposite to the golden voice crowd. Another project waiting for time and energy here is an RCA-built Wireless Sets Number 19, which can put out ten watts or so of AM from its 807 (truly a bottle worthy of the gods) - and of course, there are infinite numbers of 50s and 60s vintage thermionic projects in the contemporary magazines. It would be particularly satisfying to find the original PSU for that, as it has two Dynamotors to convert the 24V DC supply to HT, with the transmitter one cutting in when the PTT (sorry, pressel switch) is hit. I say cutting, it actually runs up to speed over a couple of seconds, giving an original 19 Set a very distinctive slow fade-in at the start of an over. Hearing one of those crackling away on 5 MHz is utterly delicious. Pete Juliano's Simple-Ceiver on Hack-A-Day Today! Check it out! Pete's awesome project -- and equally awesome documentation of the project -- is recognized this morning by Hack-A-Day! Congrats Pete! So, I got round to making my Michigan Mighty Mite! And so to the video: Not only does it oscillate on the correct frequency as shown here, it also has the added bonuses of oscillating around 21.5Mhz (which is the number my frequency counter gives - which caused a great deal of head-scratching on first smoke), and muting the FM broadcast receiver on 96.1MHz on the shelf 3 feet away!. 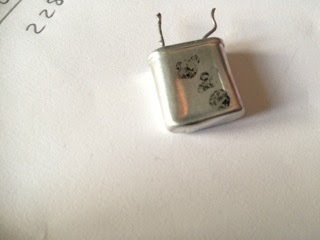 The dummy load is the 3w metal film resistor suspended in mid air. You might notice more resistors in the circuit itself than the diagram calls for. I chose to have 2 x 20K resistors in parallel to produce a single 10K resistance that could handle .6W. And the poor old 27R .3W resistor got really hot and discoloured before rapidly increasing its resistance ( !! ), so I used 4 (2 serial pairs in parallel) to handle the current. They still get hot, but survive. And the 2N2222a has a bulldog clip heatsink. Please excuse the uncorrected error at the end of the CQ call!! Thank-you, Bill. Keep up the good work. 73’s de G7TAT, Colchester, England. Pete's Simpleceiver is a thing of beauty. And it is done. And people are already building it: Jim WA7HRG has one in the works. Go to Pete's blog for more details, pictures, videos, LTSpice simulations etc. http://n6qw.blogspot.com/ Congrats Pete!